Wristbands with memory of a loved one quotes are a simple but thoughtful way to recognize and remember people who have passed away. Memorial wristbands are often used by families, but can also be used by larger communities to memorialize a person whose tragic death impacted a larger group of people. Having a memento such as a wristband can help people feel connected to the person who passed away, and can aid in the grieving process. Wristbands imprinted with a memorial tribute to a loved one can be personalized in many different ways. Choose a simple message, such as “Always Remembered” and the person’s name, birthday, and the date they passed. Choose an inspirational message that was meaningful to the person, such as “Live Each Day to the Fullest” or even something humorous the person was known for saying. Use a religious message, such as “In God’s Hands” or a biblical verse. Create the wristband using the person’s favorite color or colors. Segmented and swirled color options are available. Select from a variety of artwork that represents something that was important to the person, or upload your own artwork. Use extra wide one-inch bands or thin quarter-inch bands to make your memorial wristbands more unique. AmazingWristbands.com offers high quality 100% silicone wristbands that are durable and long lasting. Use our online builder to create your memorial wristbands, choosing from a variety of colors, fonts, and artwork to further personalize you wristbands. We do not require a minimum order on our most popular wristbands and you can count on free shipping, free artwork, free design, and free color matching. 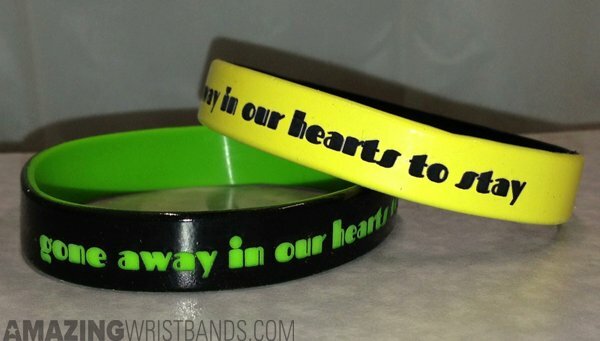 Most of our wristbands can be shipped to you in 5 - 10 days. Our professional customer service agents are available to help you design the in memory wristbands you need. To whom it may concern: my name is dorothycorbin305@yahoo.com and I ordered bracelets in memory of my momma and all of them are terrible you can't even read them. Then the last one I ordered was was 2 in memorable of my nana an 4 large adults for the guys and I got all youth sizes.our mom just passed away on febuary 10th And some of the kids got them because the large ones I ordered are all youth.i think this is ashame that we paid for glow an they say they didn't have the cemical to make them glow which they never should have made them and checked with me first . I will get them done somewhere and maybe they will do a better job. I had 3 family members that was also gonna order from you they needed like 175 when they asked me for the address I told them what happened with mine they are looking for somewhere else to get them done. Thanks for nothing.